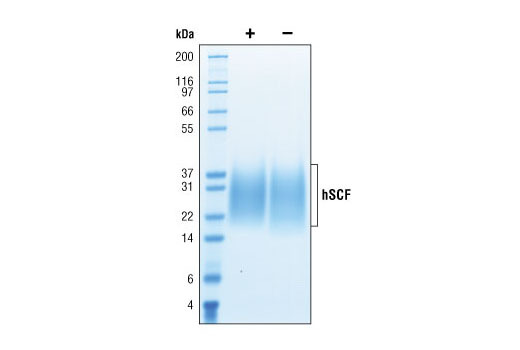 The purity of recombinant hSCF was determined by SDS-PAGE of 6 µg reduced (+) and non-reduced (-) recombinant hSCF and staining overnight with Coomassie Blue. 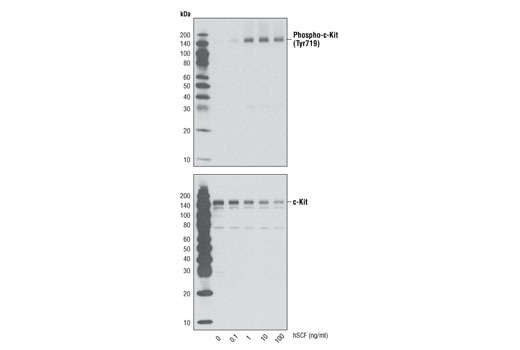 The proliferation of M-07e cells treated with increasing concentrations of hSCF was assessed. After 48 hour treatment with hSCF, cells were incubated with a tetrazolium salt and the OD450 - OD650 was determined. Recombinant human SCF (hSCF) Glu26-Ala189 (Accession #P21583) was expressed in human 293 cells at Cell Signaling Technology. >98% as determined by SDS-PAGE of 6 μg reduced (+) and non-reduced (-) recombinant hSCF. All lots are greater than 98% pure. Recombinant hSCF contains no "tags" and the nonglycosylated protein has a calculated MW of 18,458. DTT-reduced and non-reduced protein migrate as 22-35 kDa polypeptides. Lower mobility and heterogeneity in SDS-PAGE are due to glycosylation. The expected amino-terminal EGICR of recombinant hSCF was verified by amino acid sequencing. 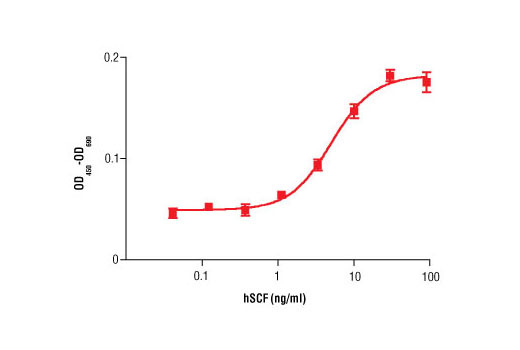 The bioactivity of recombinant hSCF was determined in a M-07e cell proliferation assay. The ED50 of each lot is between 2-6 ng/ml. Less than 0.01 ng endotoxin/1 μg hSCF. With carrier: Lyophilized from a 0.22 μm filtered solution of PBS, pH 7.2 containing 20 μg BSA per 1 μg hSCF. Carrier free: Lyophilized from a 0.22 μm filtered solution of PBS, pH 7.2. SCF is produced by endothelial cells, fibroblasts, keratinocytes, gut epithelial cells and tumor cells (1,2). SCF is critical for hematopoiesis and mast cell differentiation and has additional roles in survival and function of other cell types (1). Some tumor cell proliferation and invasiveness are promoted by SCF (3). Tumor-derived SCF appears to be involved in expansion of myeloid-derived suppressor cells that in-turn limits proliferation of tumor-infiltrating T-cells (4). SCF may have additional roles in the tumor microenvironment (2). SCF is either soluble or integral membrane and the form is dependant on variation in splicing or proteolytic release (1). SCF binds to the receptor tyrosine kinase c-kit and induces activation of the AKT, ERK, JNK and p38 pathways (5,6). Broudy, V.C. (1997) Blood 90, 1345-64. Huang, B. et al. (2008) Blood 112, 1269-79. Yasuda, A. et al. (2006) Mol Cancer 5, 46. Pan, P.Y. et al. (2008) Blood 111, 219-28. Samayawardhena, L.A. and Pallen, C.J. (2008) J Biol Chem 283, 29175-85. Huang, H.M. et al. (2000) Blood 96, 1764-71.